This Sawtooth Martingale is a very interesting method because it severely limits the case when long series losing. 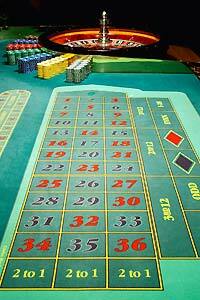 The principle of the Sawtooth is to bet 10 Units on simple chance and to put down a 1 unit for loss. Step 1: We bet 10 units on simple chance chosen. Step 2: If we win we increase the bet from one unit. Step 3: After losing we come back to a bet of 10 units. Step 4: After 2 losing, we bet only one unit until earnings. Step 5: After a earning, we resume growth in earnings where they had left it in step 2. The game is characterized by periods of games. If at the initial entry is gained, it is beneficial, it remains at step 1 until you win. Actually the game really begins at the first loss. The stage game ends when the losses are erased, it then returns to step 1. This martingale can take you far, but the amount bet is placed away from the ceiling but this method may require a good starting capital. In green, application of sawtooth martingale. CAUTION !!! : You have to stop playing when your accumulated positive and start from scratch with your base.